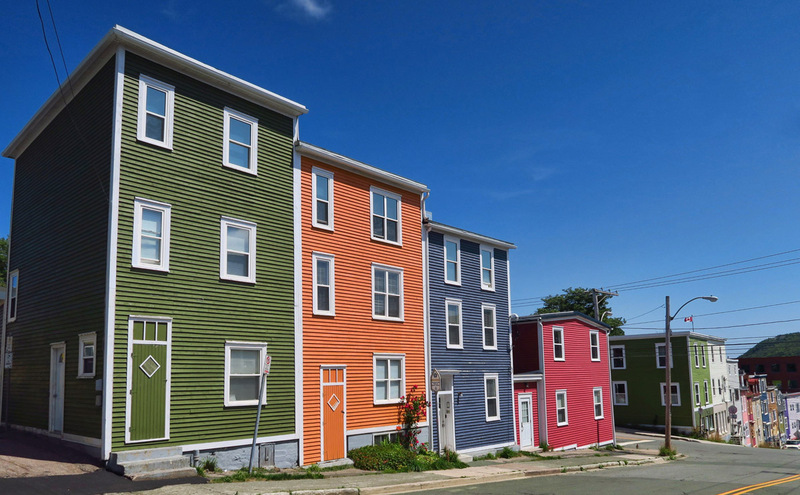 According to wikipedia, “Of major Canadian cities, St. John’s is the foggiest (124 days), windiest (15.1 mph) average speed), and cloudiest (1,497 hours of sunshine.) Precipitation is frequent and often heavy, falling year round.” So I feel fortunate to have arrived on a day fit for exploration. 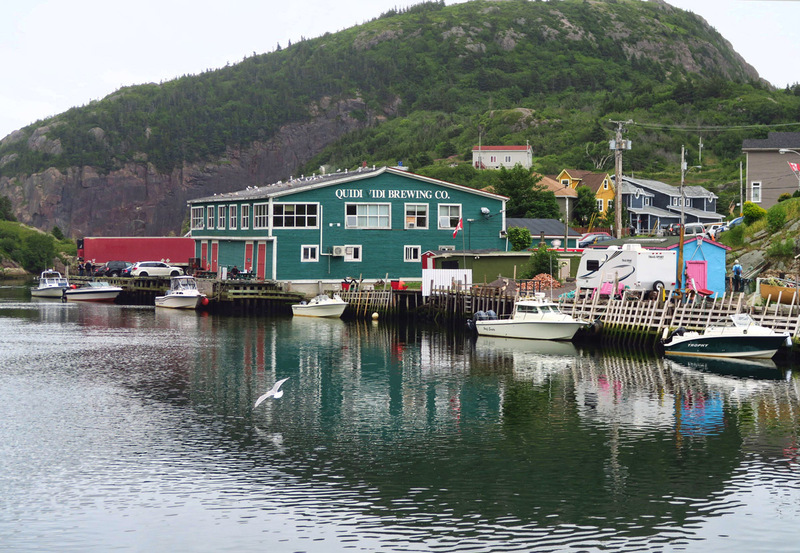 Quidi Vidi Brewery, home of Iceberg Beer, made with water from 15,000 year old icebergs. 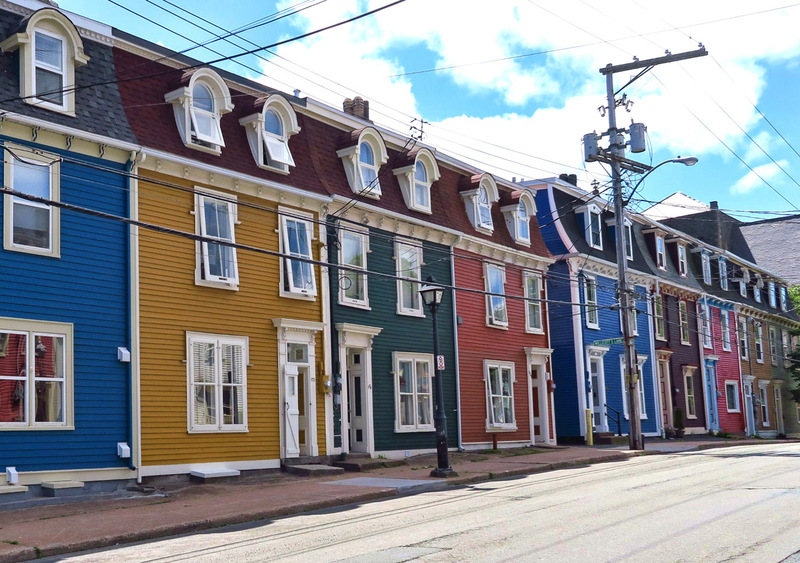 There’s lots to see in North America’s most easterly city. But this time around, my “list” doesn’t only include places, it includes people! For a month now, I’ve been shadowing Ed and Marti as they make this same loop a few weeks in front of me. They have been kind enough to let me “cheat off their homework,” as they send text messages back on recommendations of their favorite places, which have quickly become my favorite places. They have been very kind in their generous sharing of information, even more helpful considering I didn’t have much time to research once I finally made up my mind to head north. 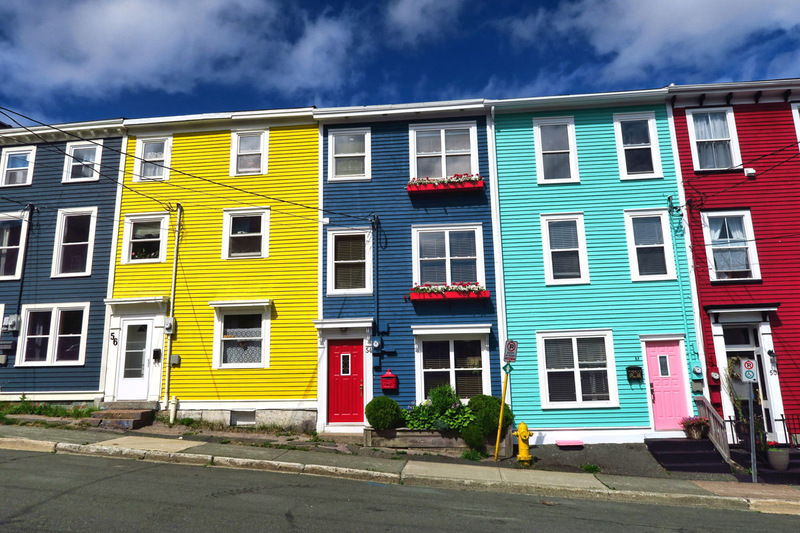 I often wondered if our paths would eventually cross, so St. John’s, it is! 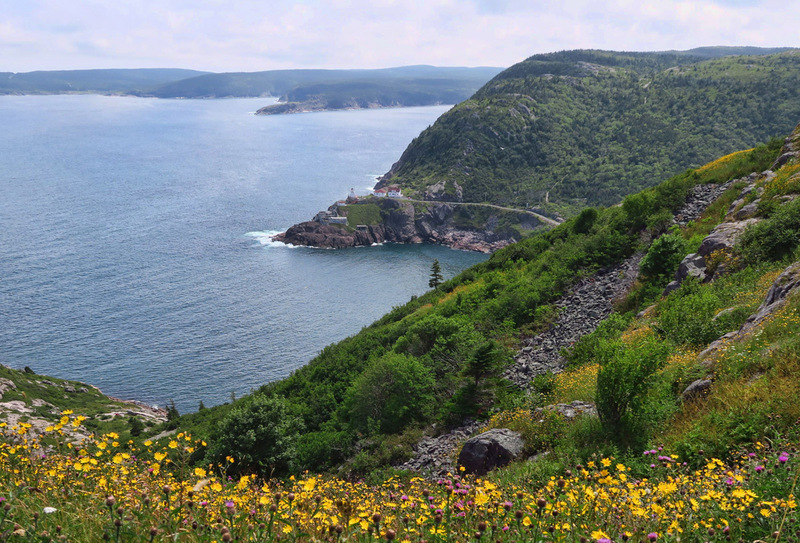 We’ll meet up at Pippy Park, St John’s 3,400 acre urban park, complete with campground. In addition to sharing a couple of “fancy meals,” Ed, Marti and I pile into their View for a city tour. This is the first time I’ve ever sat in the back of a View while someone else is driving. 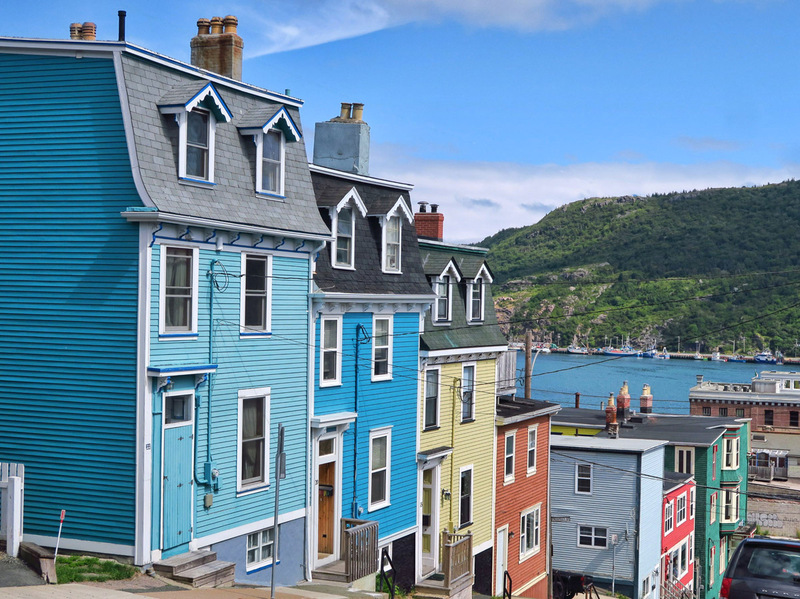 It feels bizarre to be sitting on their couch in the coach, tipping like a see-saw as Ed navigates the San Francisco-like hills of St. John’s. I enjoy the rare treat of not having to drive, but instead of looking out the window, I am watching the interior for movement, studying how our View coaches handle the road. 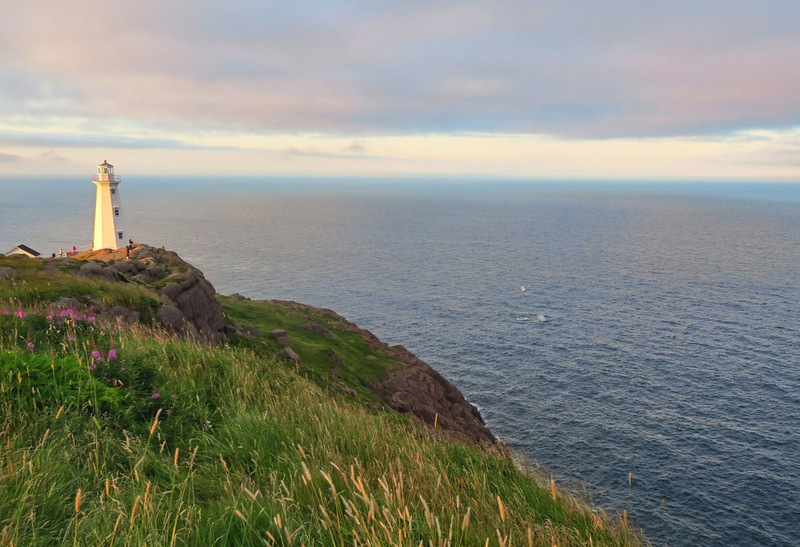 We visit St. John’s most iconic tourist attraction, Signal Hill, which offers beautiful vistas of the port city below, overlooking The Narrows, entrance to St. John’s harbor, only 200 ft wide at it’s narrowest point. 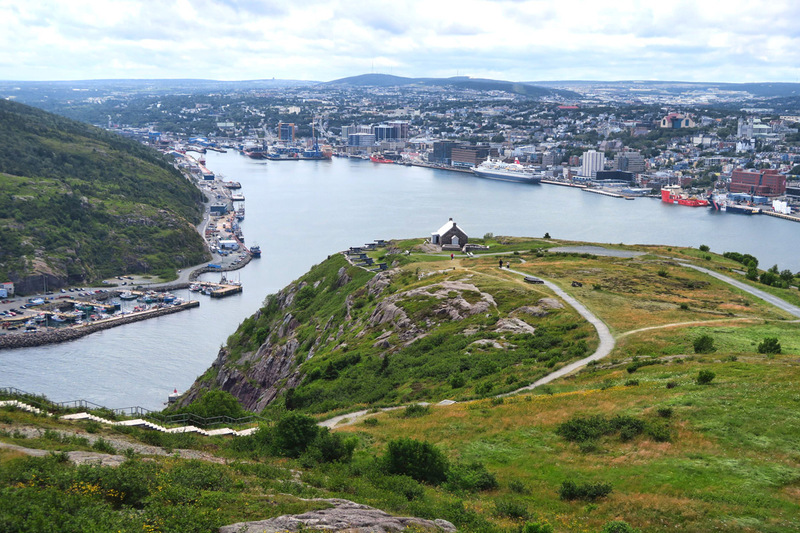 A long standing military installation, Signal Hill has been the keystone where Newfoundland’s most active harbor has been protected and defended since the early 17th century. View from atop Signal Hill. Cabot Tower, built 1897 to commemorate 400th anniversary of John Cabot discovering the indigenous peoples inhabiting Newfoundland. 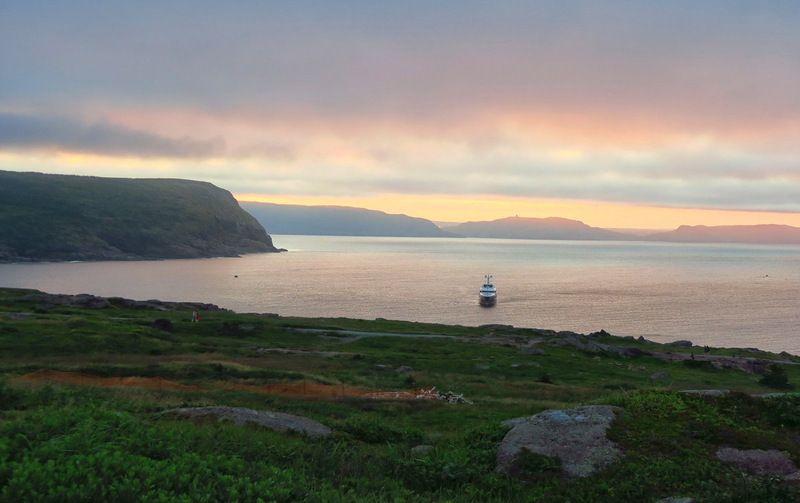 Looking back over St. John’s Harbour. 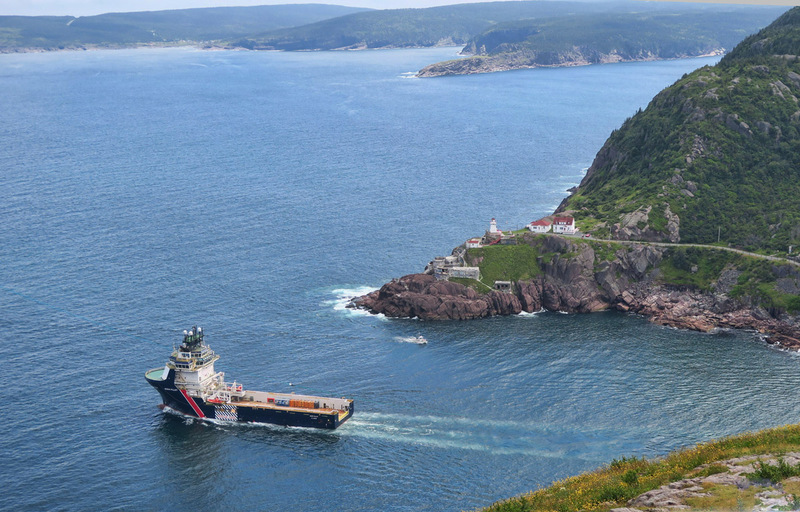 Fort Amherst, site if first lightstation in Newfoundland, constructed in 1813 at the entrance to St. John’s harbour. 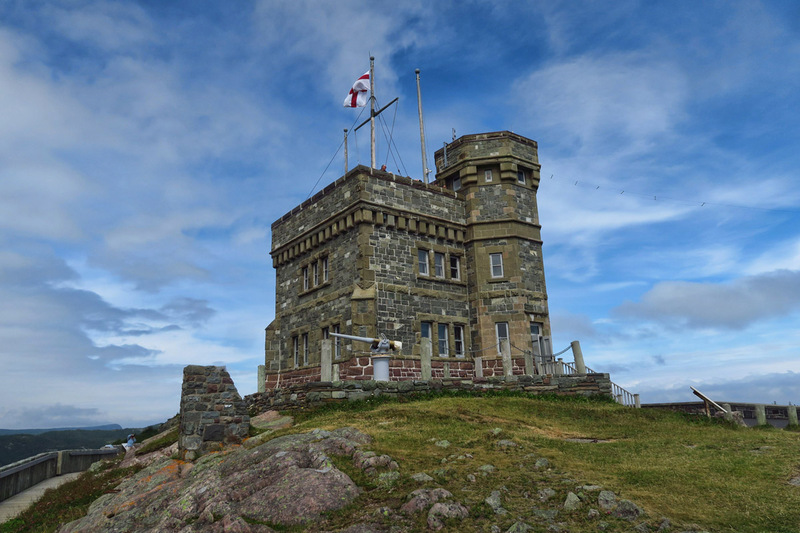 The Gothic stone building at the top, Cabot Tower, was constructed in 1897 to commemorate the 400th anniversary of John Cabot’s discovery of Newfoundland. 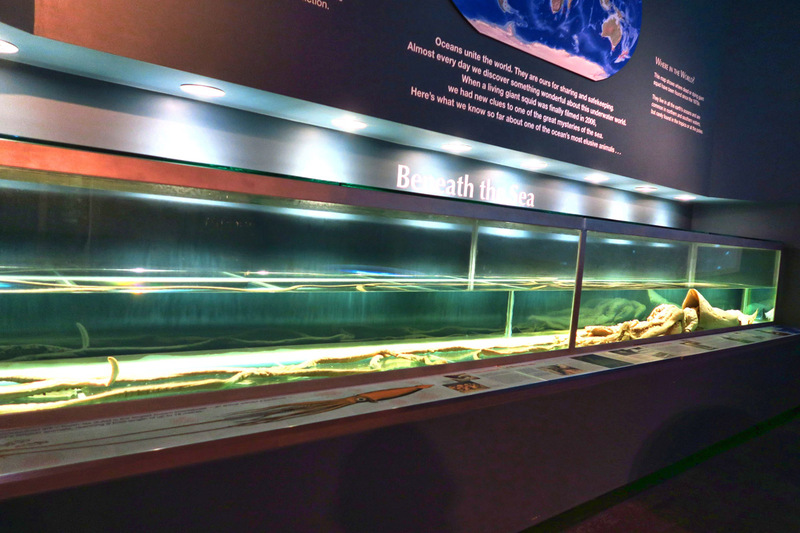 It was also the site of the first transatlantic wireless transmission in 1901, when Marconi suspended an antenna attached to a telephone receiver 500 feet up by kite, resulting in the first transatlantic wireless signal, the letter ‘S’ in Morse code. 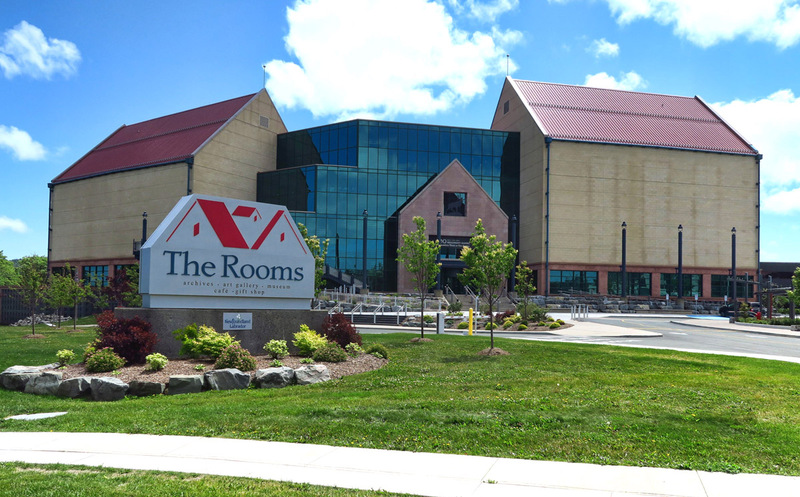 Another stop on my St. John’s “must do” list is the beautiful museum and cultural center, “The Rooms.” Again to quote Wikipedia, “The building’s name, as well as its architecture, is a reference to the simple gable-roofed sheds called “fishing rooms” that were once so common at the waterline in Newfoundland fishing villages.” The museum houses four floors full of artifacts of indigenous peoples, history of the fishing industry up to the cod collapse, examples of native flora and fauna species, audible exhibits of musical history and Newfie dialects. 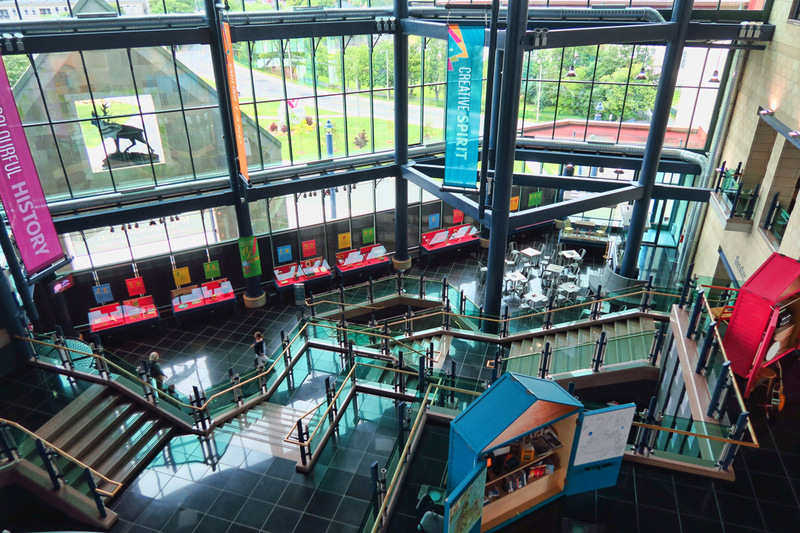 The Rooms Museum and Cultural Center, built 2005. 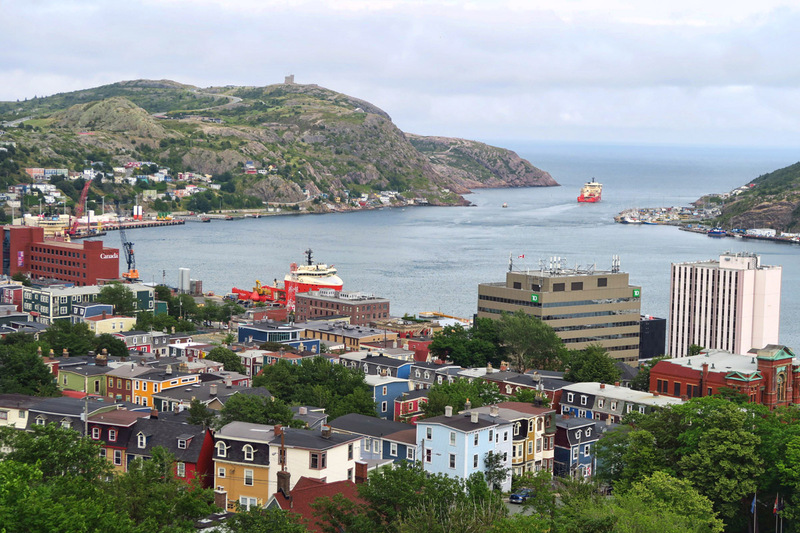 Located high up on a hill, the museum offers several observation decks to look down on the town of St. John’s. 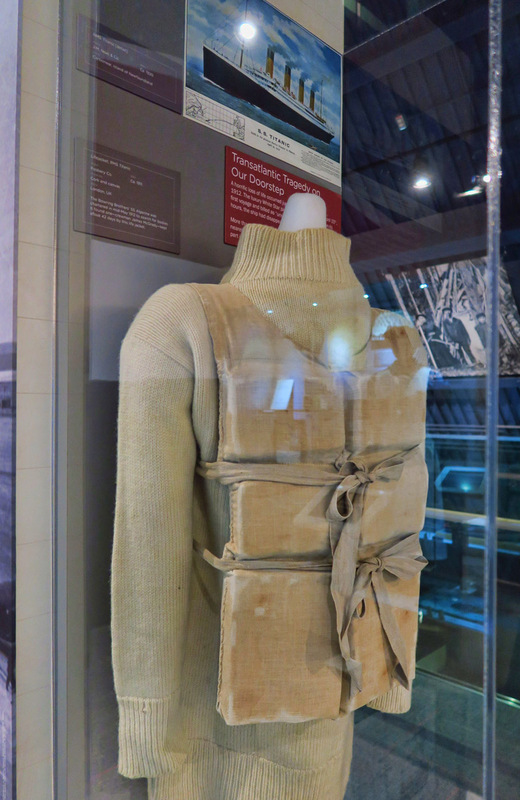 Life vest from the Titanic. 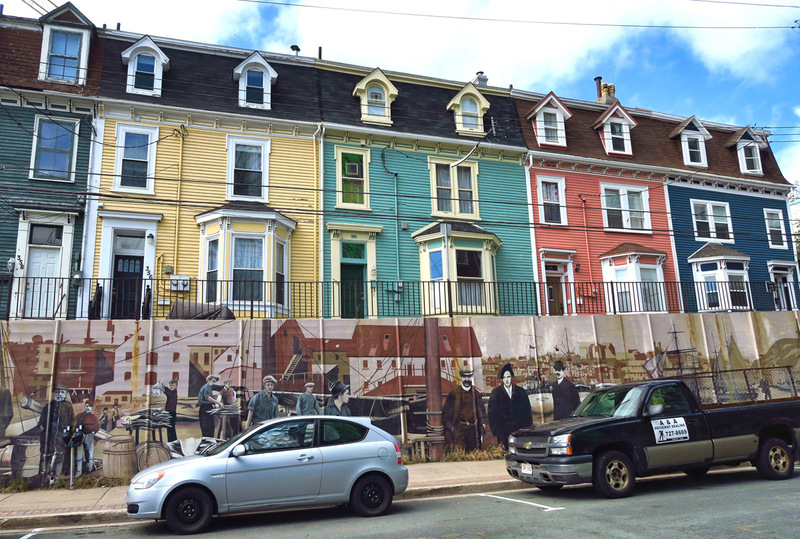 I think parking should not be allowed in front of this beautiful mural in front of the jellybean houses! 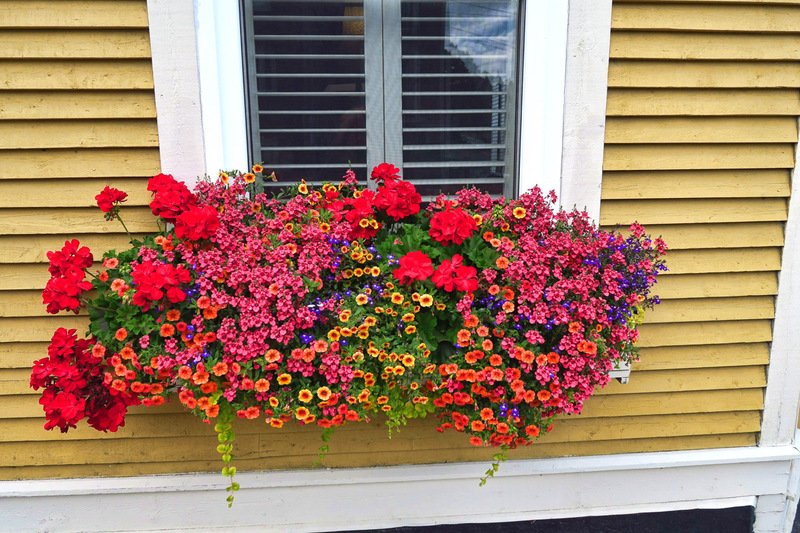 A brief glimpse in between cars. 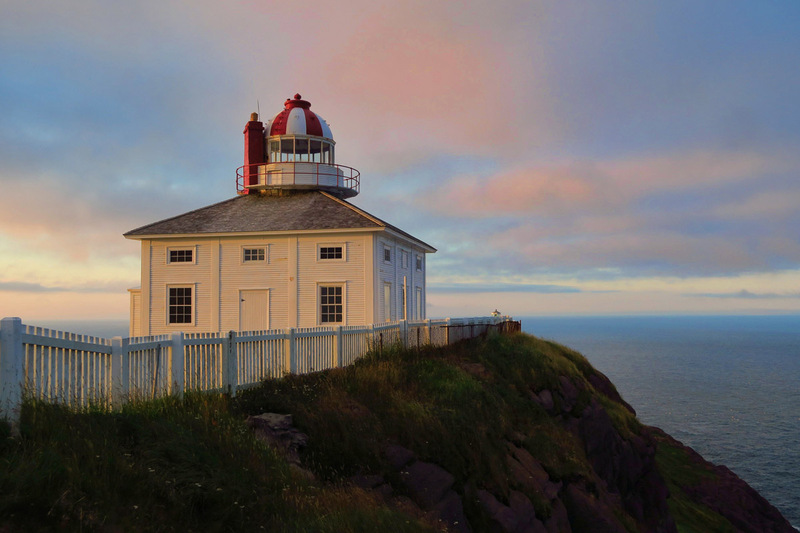 While Signal Hill is St. John’s most famous landmark in town, just 10 miles on the outskirts is its rural rival, Cape Spear, Canada’s oldest surviving lighthouse and North America’s easternmost point. 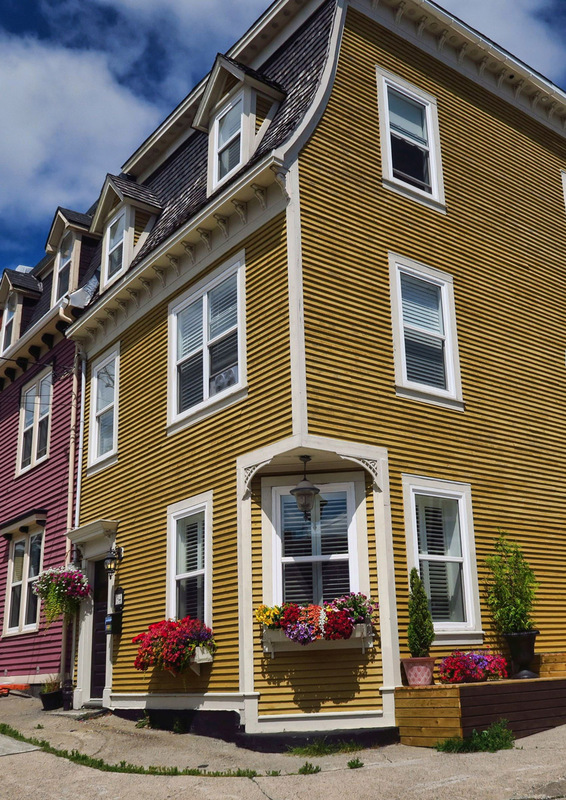 Built in 1836, the original wooden house with stone tower in the center is now a National Historic Site, filled with period furnishings, circa 1839. In 1955, a more modern concrete tower was built just 200 yards away. 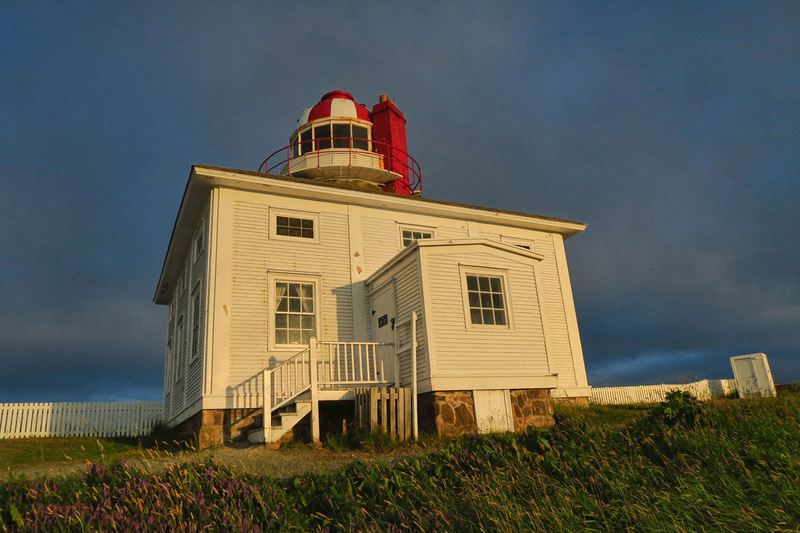 In 1912, the original equipment was replaced with a Fresnel lens, which now functions with a 500 w electrified lightbulb in the new tower. 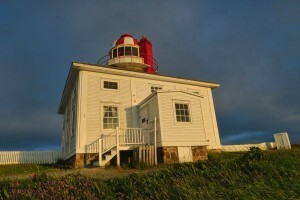 This style of wooden house around stone tower is similar to Cape Bonavista Lighthouse. 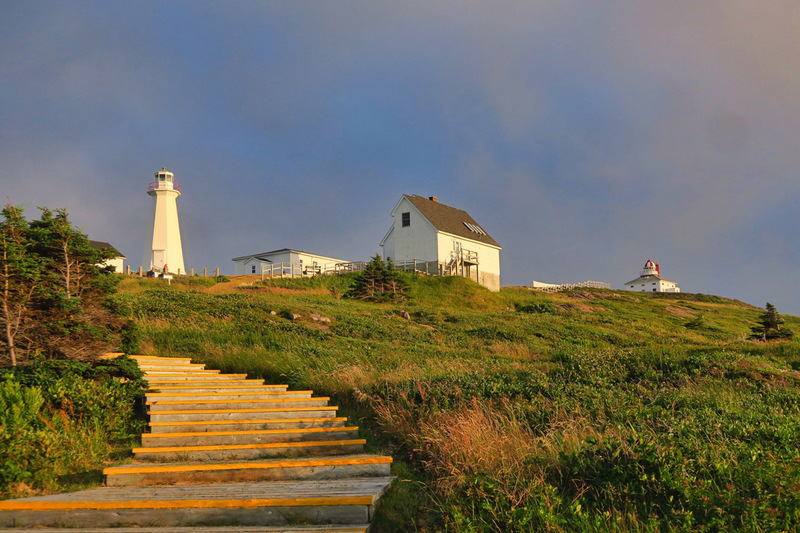 The only difference in the two is Cape Bonavista’s wooden structure is red and white striped, while Cape Spear is solid white. Can you see the whale spouts offshore? 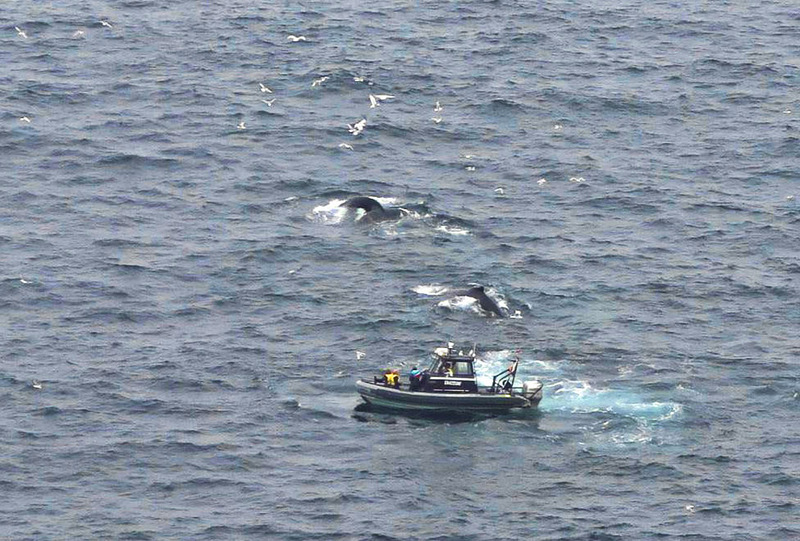 If you click to enlarge this photo, you will see a whale’s tale to the right. 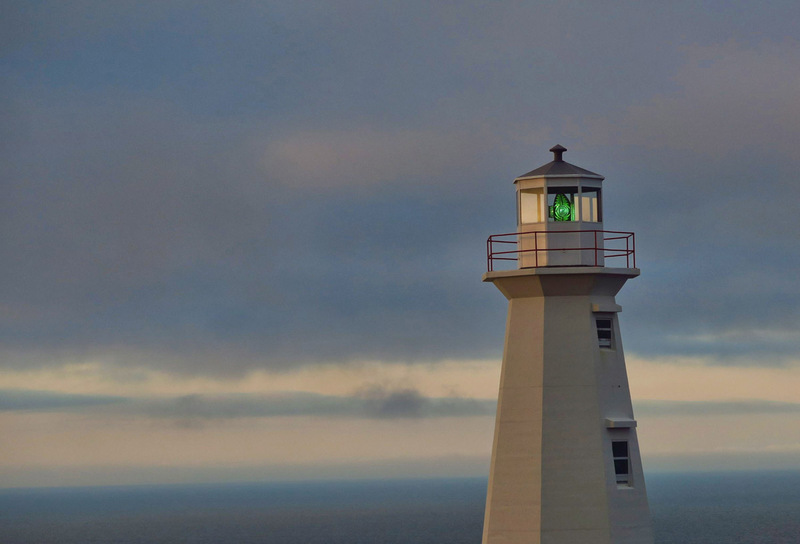 Why just the top half of the 1955 lighthouse? Because some moronic fool spray-painted graffiti in the bottom half! I will not publicize their crime! My boondocking neighbors for the night. 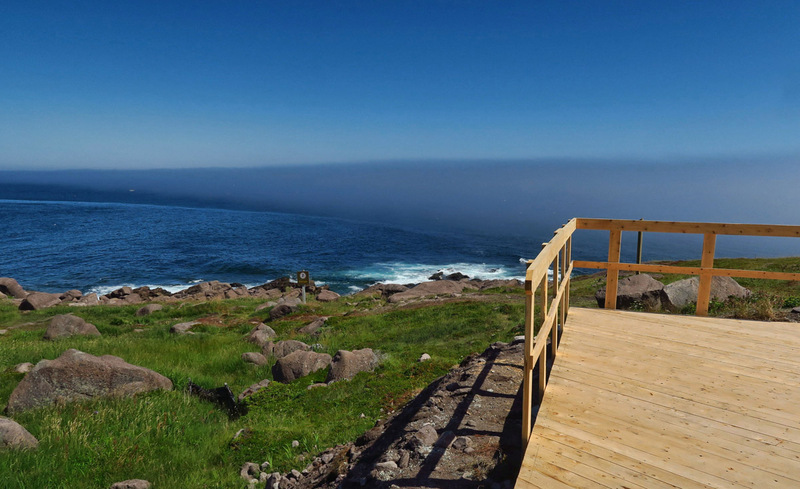 Note fog bank rolling in toward North America’s most easterly point. 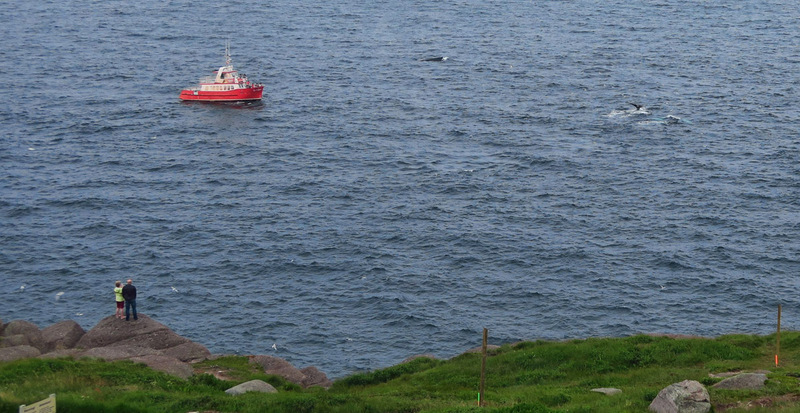 Behind me is the entire population of North America, in front, Ireland. 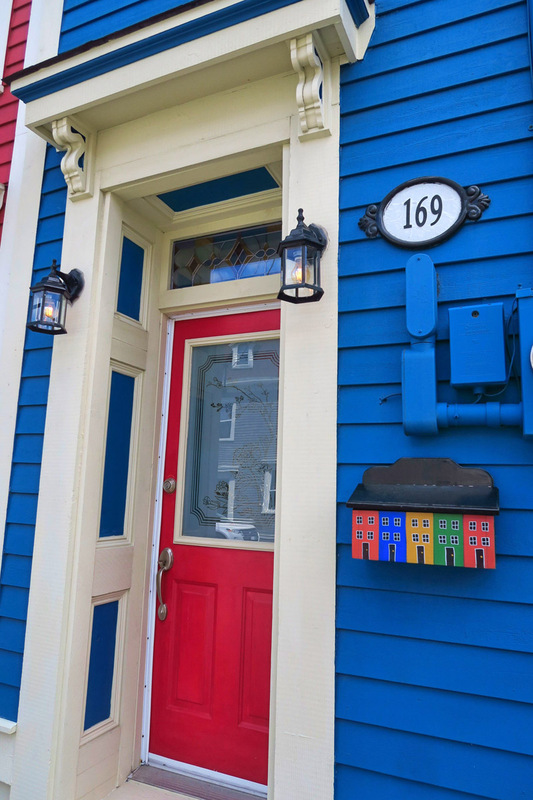 This entry was posted in Canada, Newfoundland and tagged Cape Spear Lighthouse, Cape Spear National Historic Site, Jelly Bean Row, Pippy Park, Signal Hill, St. John's, The Rooms by Suzanne. Bookmark the permalink. 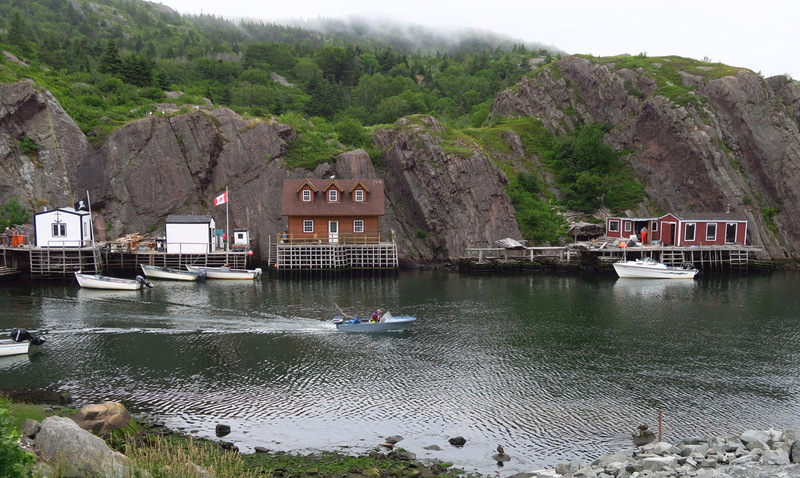 As always, I am astonished by how beautiful that part of Canada is. 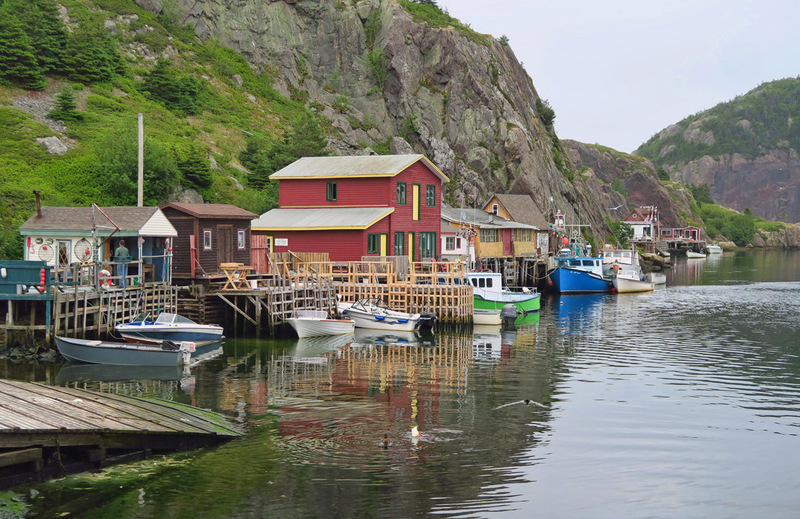 It seems as though every bit of these provinces are extremely photogenic! We’re in. lol. Thanks for the shout-out! 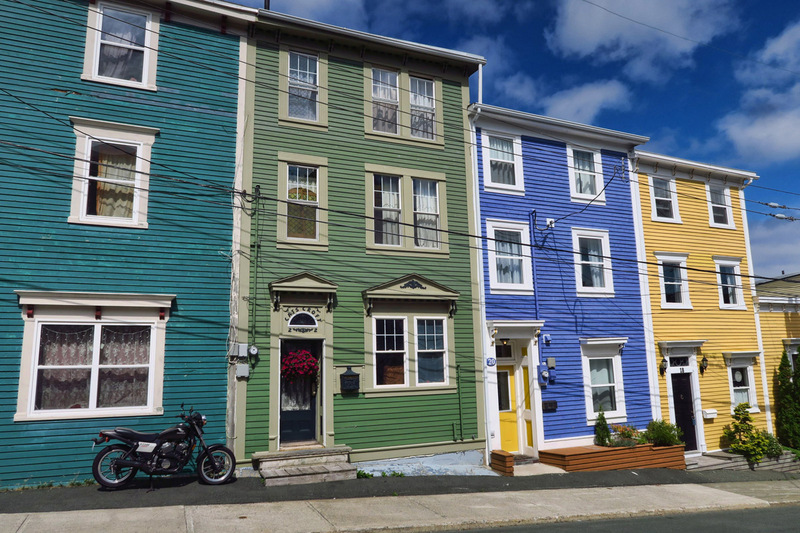 Point of fact: ALL Canadians call them “Ski Doos,” not only Newfies. Trademark of Bombardier and proudly made in Canada since 1959! We called them Ski-doos too, in western New York in the ’60’s anyway. Big help for farmers during the day. At night they went flying on trails through the woods. Could hear them all around and see the lights. Beautiful photos as always. You have a great eye. Yes, the scenery is gorgeous, but I love the names. Quidy Vidy, Pippy Park, and Jellybean Row all sound like names from a children’s book. 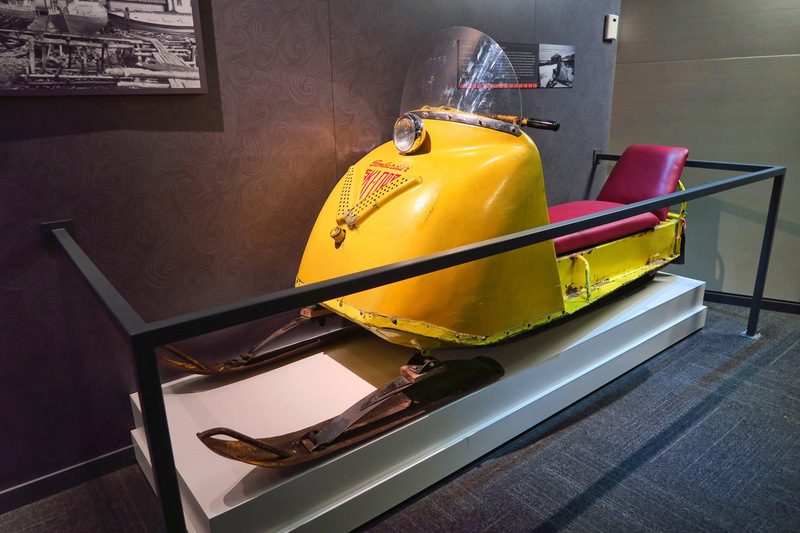 Ski Do was made by Bombardier which is a major manufacturing company these many years after their pioneering snow machine. 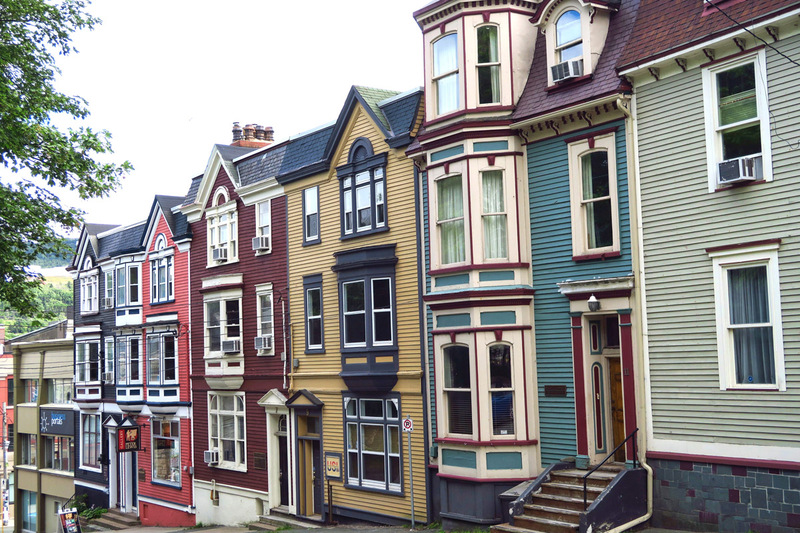 I had been debating the inclusion of St Johns to my bucket list and now it is included. 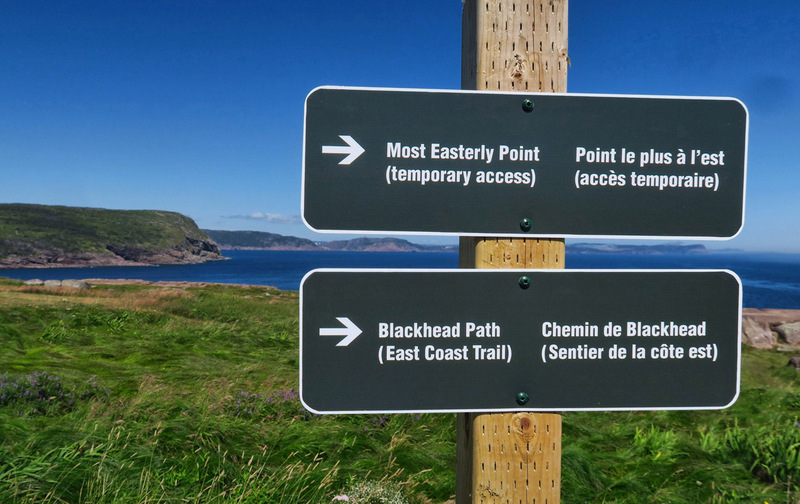 Great trip, I do not know why you crossed the continent to explore Newfie, but we are grateful. Keep on!! Did you see or tour any tall ships while there? I follow some on fb and there was a gathering in that area recently. One ship is called Picton Castle. Hi, Teri. 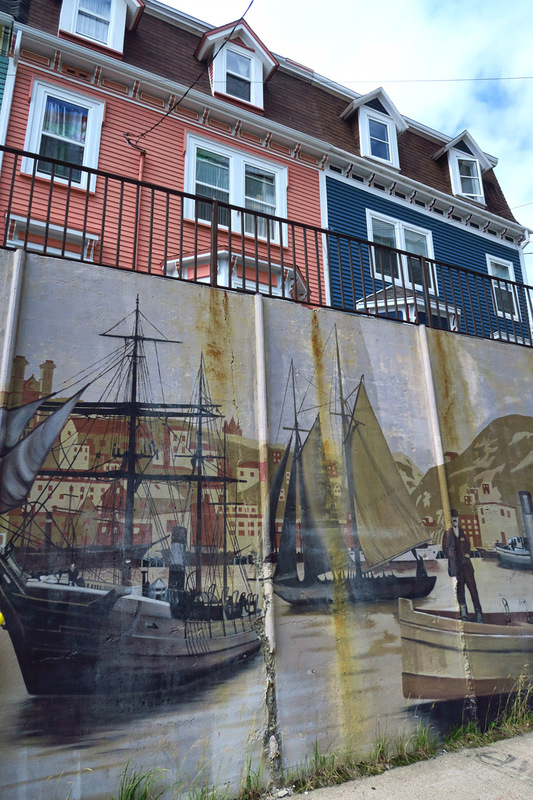 Yes, I did manage to catch the tall ships in St. John, NB, and Picton Castle was one of them! I haven’t even had a chance to get the photos off the camera yet, but will post a few pics when I do. Thanks for the question! Your fog photos look a million times better than my fog photos from the Northern Pacific Coast! Just fabulous Suzanne. Every time I read one of your posts I am green with envy that you are taking the trip I have had planned for several years. But yours is better than mine so I’m just going to do yours when/if I am ever able to. Where did you hang out to get the bike? Did you get my response to your email?? I’ve been having trouble with my account. Hi, Sherry…I did not receive your response, and I was sad. 😉 Can you try resending it? So happy to be a Canadian, thanks for the exposure. …and, umm, well we all call them ski oos, even on the Isla in Mexico. 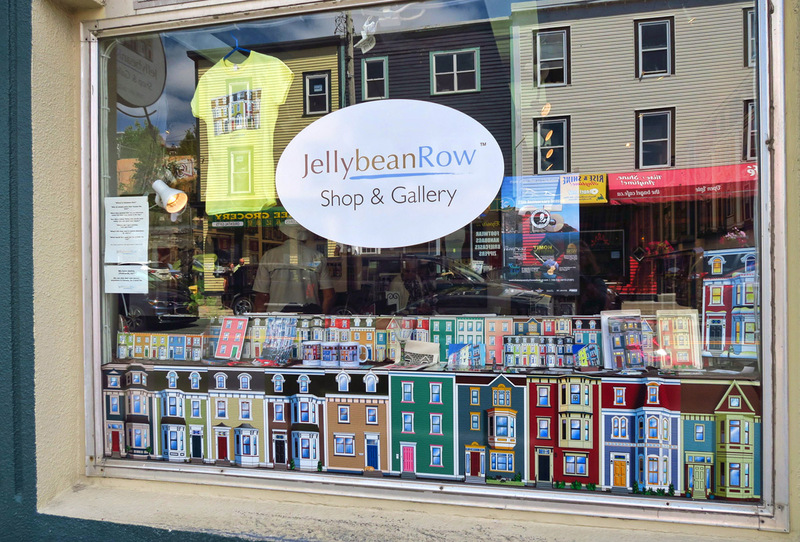 Jelly Bean Row is awesome!! 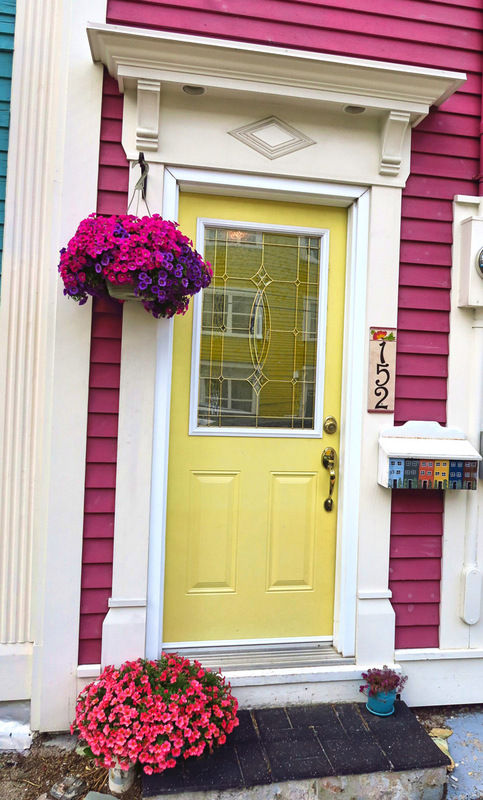 Love all the bright colors and cute mailboxes:) How nice for you to meet up with your “planners.” What a beautiful area!